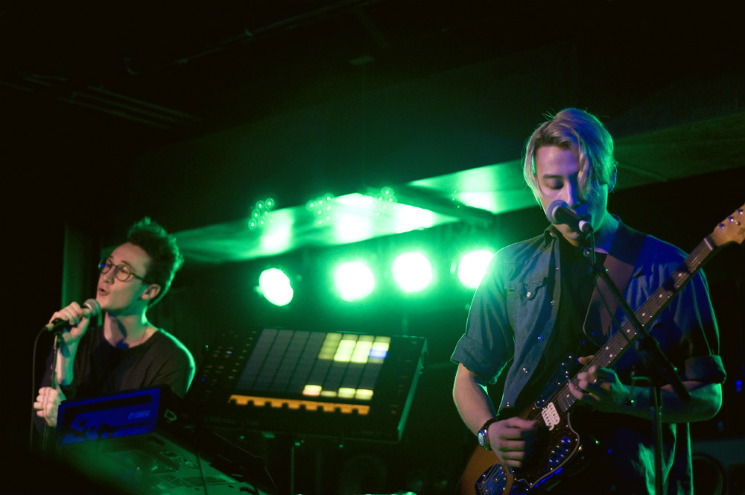 There was much hype surrounding Beach Season's performance at SoundOff before they even hit the stage; the local duo have several impressive accomplishments under their belt already, such as touring throughout Canada and the UK, as well as having attended Red Bull Music Academy. Although they were late to the stage, they proved worth the wait. The sound of crashing waves introduced their first song, as the duo launched into a laid-back showcase of intimate tracks. Their self-proclaimed "booty wave" entranced the audience with crisp rhythms and warm bass, coupled with vocalist Sam Avant's smooth vocals. Curious electronic lines weaved around Avant and multi-instrumentalist Simon Blitzer's vocal harmonies on "Evenings," from their Internet Evening EP. Avant has an understated confidence to his vocal delivery, allowing Blitzer's skilled instrumental work to shine. Beach Season are a well-balanced duo, a musical partnership that promises more success to come.